The Nebo Afterschool Program held their Lights On Event on Monday, November 6th at the ALC Building. It was a Harry Potter themed night and brought lots of wizards and muggles in for a night of fun and magic. The Afterschool Program Coordinators from 8 different schools in the Nebo School District, all came together to host this event. When you first entered through Hogwarts Express 9 3/4. You were met by Spanish Fork's Site Coordinator, Eric Ferrin. He would then give you your Hogwarts Punch Pass to Prizes. (Posters and Punch Passes were created by him). When the students had finished attending all of the events, They could return it to Mr. Ferrin and receive a prize. The Sorting Hat activity was hosted by Diamond Fork Jr. High ( Site coordinator- Stephanie Thorne) It was a fun activity where you could find out what house you would belong to and also do a little origami sorting hat of your own to take home. 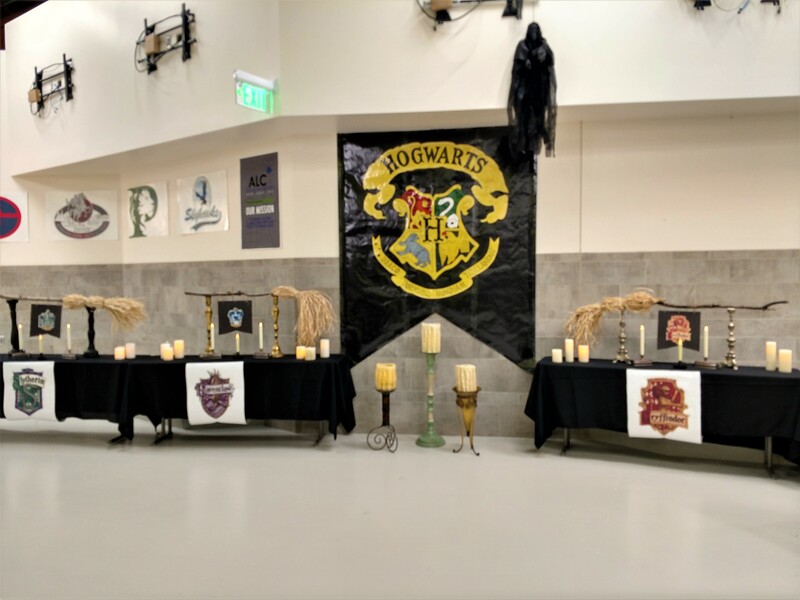 The Hogwarts Ball was hosted by Salem Jr. High ( Site Coordinator- Brenda Betteridge). This was a fun, active event where you could try your hand at musical magical chairs. If you won, you were awarded a bag of Bernie Botts jelly beans. Canyon Elementary- (Site Coordinator- Callie Chinen) & Payson Jr. High (Assistant Site Coordinator- Kayci Ogden), hosted the Honey Dukes Sweets shop. At this shop, you were able to make an owl, who was not only very wise looking but also very clever and tasty. Rocket Quidditch was hosted by Riverview Elementary- (Site Coordinator- RaeAnn Nelson) & Payson Jr. High(Site Coordinator- Mike Farley)- manned this event. It was fun to see the students make a rocket and then try their hand at trying to score points through the hoops. They could also color a Hogwarts tie to wear for the evening. Ollivanders Wand Making Shop was headed by Orchard Hills Elementary. (Valerie Mecham- Site Coordinator). It was so fun to see the long line of wizards trying to get their wands made to be the perfect fit for them. There were some very creative wands. We had over 100 people turn out on this rainy night, and appreciate those from the District who came, including Superintendent Rick Nielsen and his family. IT WAS AN AMAZING FAMILY FUN NIGHT!! THANKS FOR ALL OF THOSE WHO TURNED OUT FOR IT! THANK YOU TO ALL OF THE SITE COORDINATORS FOR ALL OF YOUR HARD WORK !! SPECIAL THANKS TO LARSEN ELEMENTARY FOR THE USE OF SOME OF YOUR AWESOME PROPS!! !